Over the last few years I have bought several of Richard Borg’s games based on the “Commands & Colors” format. 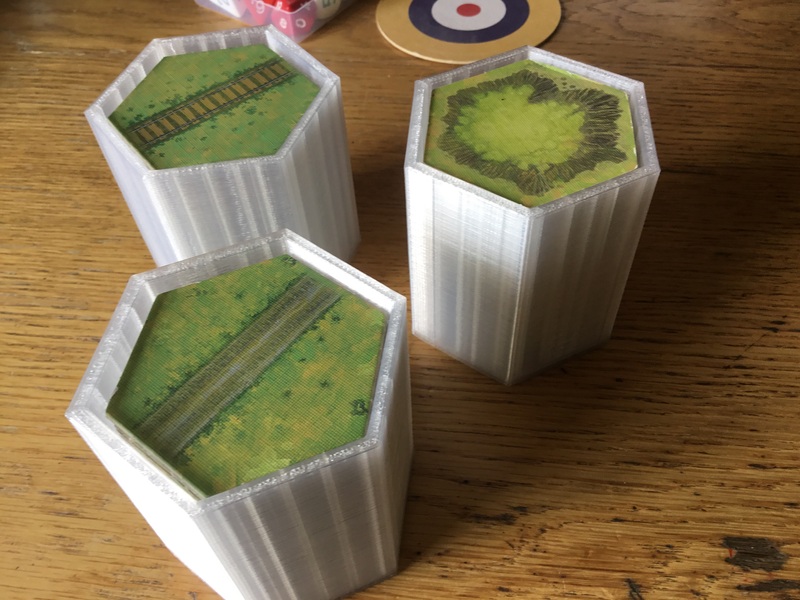 These games contain a lot of cardboard terrain hexagon tiles, but are not very good at providing storage for them, particularly once one begins to acquire expansion sets. My particular bug-bear is Memoir’44, which does provide storage boxes, but made in a way that makes the tiles difficult to extract, and they are quite flimsy. And so I have pressed my 3d printer into service, and using the online free design program “Tinkercad”. I have created my own boxes. Each of these holds 36 double-sided tiles, and should fit nicely into a Really Useful Box (we shall see when I have printed enough of them). I might get organised enough to label them, but that’s a job for another day! The downside is that each one takes over four hours to print. When I have enough of these I will try making boxes for the rectangular terrain elements like bridges and bunkers, and maybe even circular ones for the counters. Played to Memoir ‘44 rules, with local scenario special rules. 406 Landesshützen Regiment, now reduced to three companies, is facing an estimated two companies of US parachute infantry holding a crossroads near their observed supply drop zone. With no definite orders from Corps HQ, I rolled a die for the local commander’s decision. A 6 showed that, with odds of 3:2 in his favour, he would order an attack. Unfortunately for the Germans, when I rolled for the detailed force make-up, one of their company units was no more than a battalion HQ, which can be useful if there are a lot of units under command, but possibly not so useful in this case. The rest of the force was made up of six rifle platoons, one mortar platoon and one platoon armed with Panzerfausts. The second potential problem was that there turned out to be three American companies rather than the expected two; two with mortar platoons and all elite forces. I use the US Marines “Gung-Ho!” rules for US parachute infantry, which is effectively about the same as giving them a free HQ unit, allowing one more unit to be activated than the number allowed on the command card. The picture above is looking from the south (US) side. Rough heathland to the left, flooded polder to the right with a farm near the crossroads. The Germans, with 9 platoons, start with 3 command cards. The Americans, with 12 platoons, start with 4 command cards. Victory points. Side with the lowest units, with number of units divided by two, rounding down. Both sides have 3 units, so 1 VP ends the battle. Both sides win 1 VP for eliminating an enemy unit. 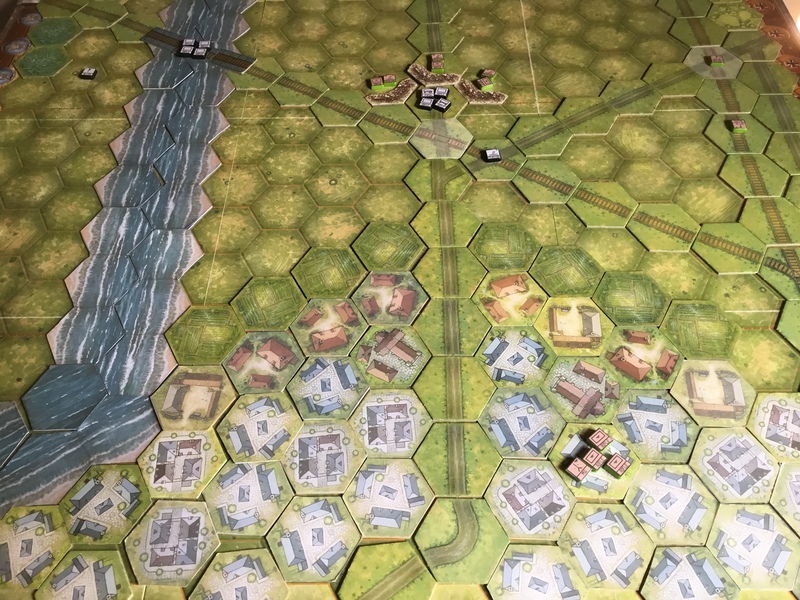 The Germans will win 1VP by exiting the field at the crossroads. The German player, with orders to attack, must make at least one aggressive move. But with no useable cards, he must surrender one card from his hand and take another. The initiative is lost. The American player has only one playable card: Recon with 1 unit. “Gung-Ho!” rule increases this to 2 units. The left flank company advanced half-left and opened fire on the enemy, supported by the mortars of the 2nd company. 1 hit and 1 retreat. Observing the strength of the enemy, the attack stalled. The Americans initially opened fire with mortars, then advanced a rifle company on the left flank which drove the Germans back with light casualties. The German player was still not able to use any of the cards in his hand. Nor was the US player. Still no useful cards for either player. The German player still had no playable cards. The US player used “Direct from HQ”, allowing orders to any four units. 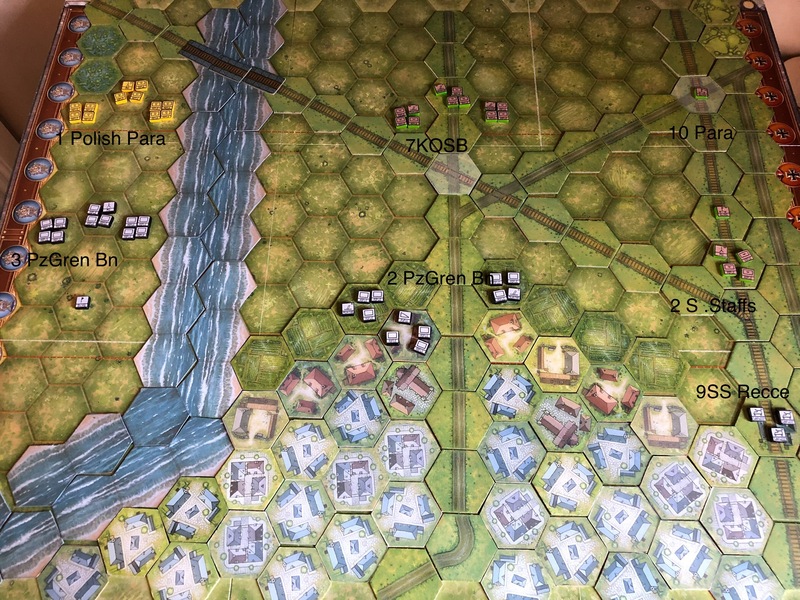 I use this in the campaign to include off-table reinforcements within one map square, so the four companies of 3rd Bn 508th PIR arrived on the left flank. This brought the US strength up to 25 units, and thus 8 command cards, so 4 more were drawn from the pack. At around 14:00 US reinforcements arrived from the south-west in the form of 3rd Bn 508th Parachute Infantry Regiment: HQ, 10 Rifle platoons and 2 mortar platoons. Finally the Germans had a useable card. Attack Center. The right flank company advanced to fire on the US left flank company, supported by the mortars of the other company. 1 hit and 1 retreat. The US played Attack Center. 3 units. The mortar platoon attacked the enemy to the left with 1 hit. The two rifle companies advanced and fired. 2 hits and 2 hit respectively. One German company eliminated. 1 VP. End of game. The Americans advanced both rifle companies, supported by mortar fire. One of the enemy companies broke and ran. The remainder began to fall back. Maybe it’s a personal thing, but I have always found watching machines producing things fascinating. In my working life I always enjoyed factory visits, just to see how the machines, designed by humans, could make parts ad infinitum, and then combine them into meaningful artefacts. When I bought a 3d printer the effect was the same. I can sit for ages watching a project brought to life by intricacies that I will always fail to understand. My latest project is a simple storage box for hexagon tiles of about 6cm (for several board games and my own wargame tiles). Each box is designed to fit with a number of others into a specific “Really Useful Box”. 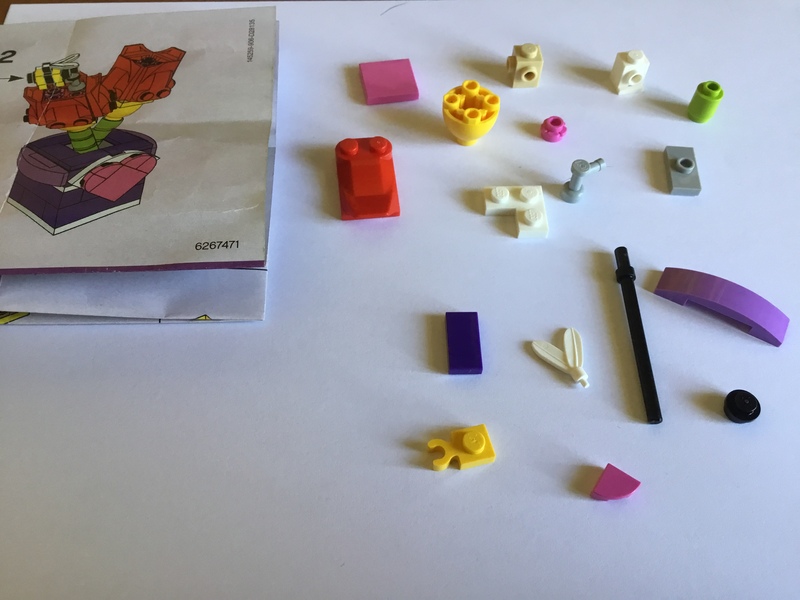 Each storage element will take 4 hours to print, so it will be about two or three days before I will actually know if a group of them can fit the storage box and incorporate the hexagon tiles in the intended way. Today I watched on the “Talking Pictures” channel a Rank short film from the 1960s instructing us all how to use the telephone properly for business purposes, with preparation and politeness. Other communications available at the time (referred to in the film) were letter, memo or telex*. No mention of the “sneakernet”, whereby you walk up to the message recipient’s desk and actually talk to them! One of the major points of this film was that you could not be seen while making a ‘phone call, and would it not be so much easier if you could be seen by the caller. In the meantime we had to adapt our behaviour to make allowances. Well, now we can see each other, is it actually better??? If anything, we have got so used to being available telephonically that both caller and recipient are less courteous, and with the advent of worldwide call centres many of us now detest the telephone and use other communication methods, like this blog for example. *in the early 1970s I became by accident a telex expert, and could translate between numbers/symbols and letters on the frequent occasions on which the telex tape broke. Telex tape was punched with a sequence of 2 and 3 holes (above and below the line), and each group of 5 holes represented one character, either alphabetic or numeric/symbolic. If the tape broke or the telephone signal was corrupted for a moment (as frequently happened) then the rest of the message could be transcribed by the system into the wrong alpha or number format, and had to be reinterpreted. Posted on April 8, 2019 Categories Life in GeneralTags 1960s, communication, courtesy, Nostalgia, telephoneLeave a comment on The “Good Old Days”?